Hi! As promised, I’m trying to get back in to a regular rotation of posting some of my daily outfits. We had a mostly mild November with some colder weather blowing in this past weekend. 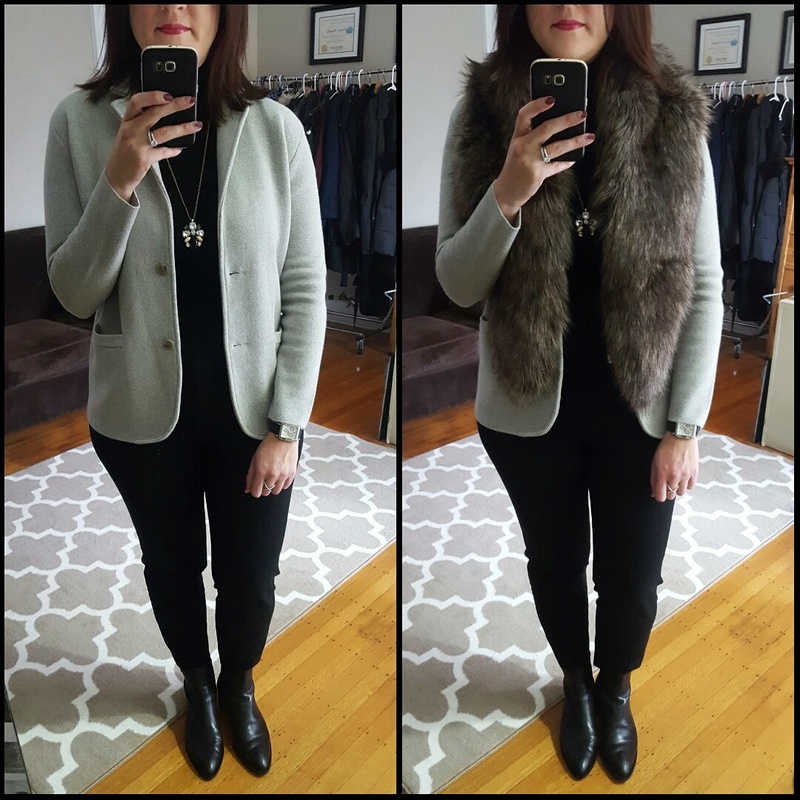 Before we turned the clocks back, it was increasingly hard to drag myself out of bed in the morning, so planning my outfits in advance when possible really helps my getting ready time in the morning. First up, is an outfit that I put together starting with these Banana Republic Avery pants, which are my new favorite pant. These pants have a slim leg but a more generous hip area, while still fitting my waist. When I ordered these pants, I also ordered a camel cashmere turtleneck and I’ve had the camel/orchid combination in my head since I received my items in the mail. I’ve done a pairing similar to this in the past with my older J.Crew wool café capris in a similar color that don’t fit me anymore. I love mixing leopard and pinstripes and with the pink it all just sort of worked. Not sure how that happens some day, but if it feels good, I go with it. Now for some neutral looks. As we get in to fall and winter, my color palette often gets more subdued but I’m sure we’ll see some red coming in December! First up, some black and ivory along with some pattern mixing. I first had my eye on this blouse in the burgundy color but when I was shopping at J.Crew a few weeks ago, I spotted the polka dot version. This blouse reminds me of some I used to have years ago and I still love some ruffle details. A little while later I caved on the pants during the 40% off holiday sale. These are currently sold out but I’m sure we’ll see them pop back in the coming weeks. Elastic waist but still polished? Sign me up. 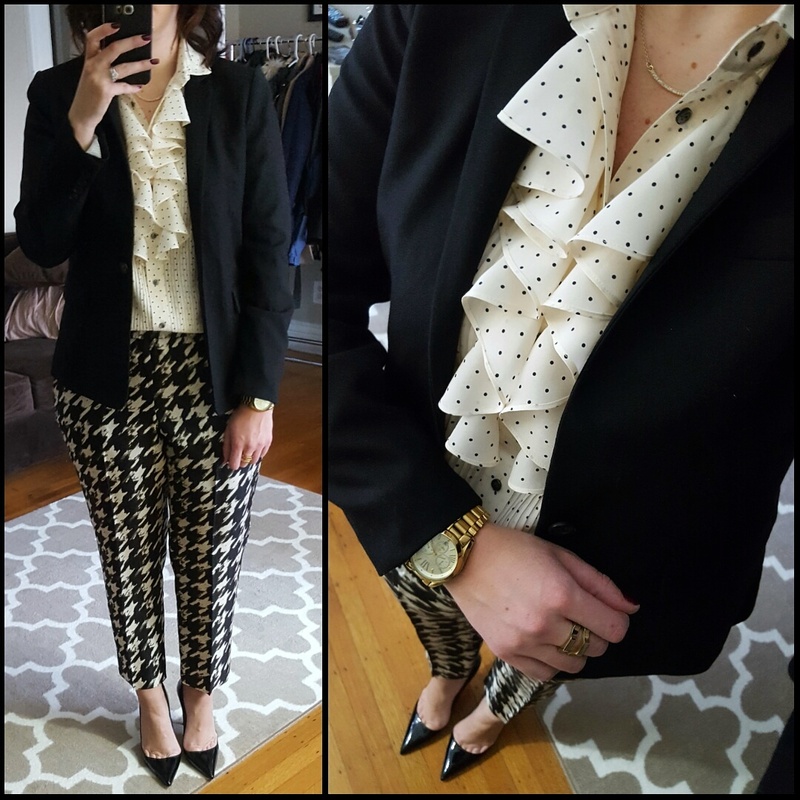 I had the polka dot blouse laid out to wear with a different skirt and blazer but when I received the pants in the mail I had to wear them immediately! And wouldn’t you know, they matched the pants pretty well. The outfit looked a bit too stark with all of the ivory in the blouse and pants so I added the blazer to break up the lighter color. With the fuss of the ruffle in the front I went with a simple necklace and some black pumps. I wore patent blazers for my walk to/from the car and could have kept the loafers on all day as well. I almost went with red shoes with this outfit – another option I’ll keep in mind for wearing these pants in the future. This outfit was a big hit online as well as in the office. 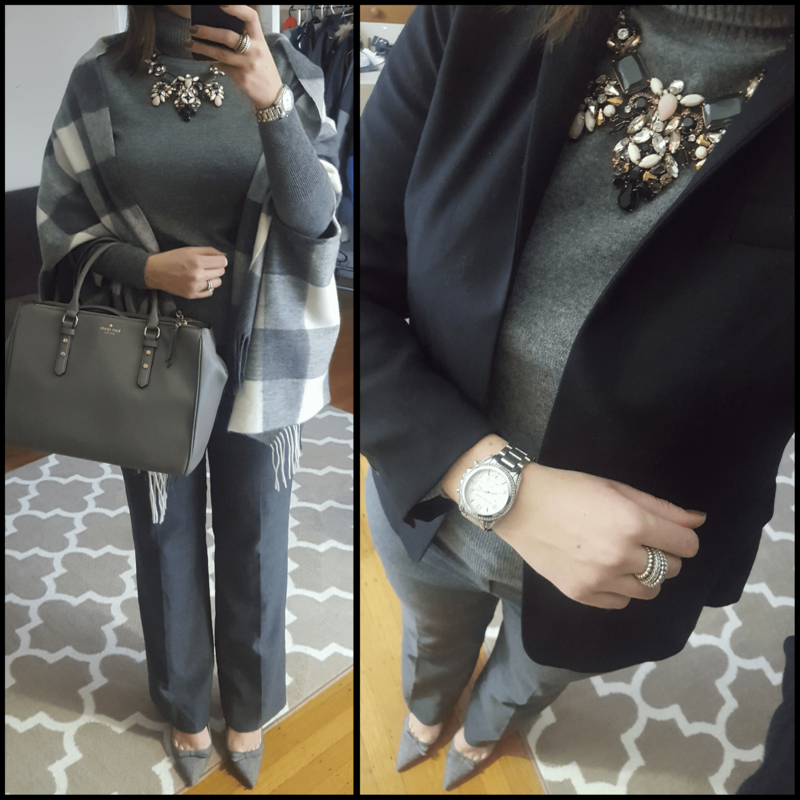 Next up, a monochrome look that was inspired by my wrap scarf. And another black and white look. I have had this jacket for a while but this is the first time I actually zipped it up when wearing it and I liked it so much better this way. Not that I didn’t like it before, but it worked perfectly with this ponte dress and added some color contrast. I love this dress on it’s own, but adding the tweed jacket made it look more like a suit. Here’s one more monochromatic look that I wore a few Fridays ago. I tried this sweater blazer on in store when it first came out and passed on it and of course it promptly sold out which of course led to me wanting it even more. So I stalked it daily online until my size popped back (I sized down to a small) and I am glad I got my hands on it. I was perusing Polyvore for outfit ideas and saw it paired with all black so decided to go with that for a Friday and added the faux fur scarf for a bit of fun. I picked the scarf up on one of my recent trips to the Niagara Falls outlet mall and am looking forward to styling it more throughout the winter. 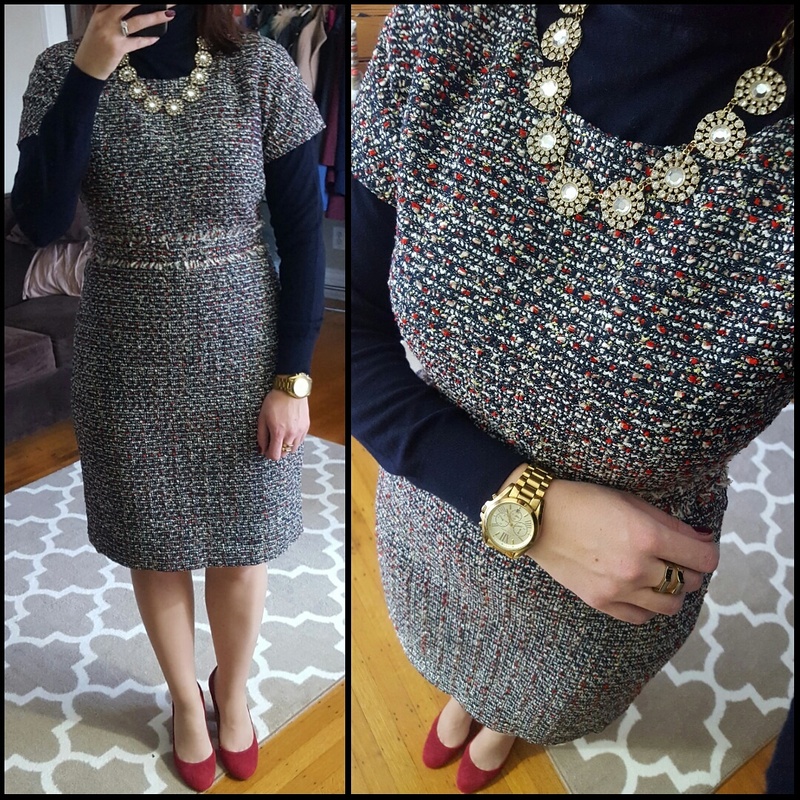 And lastly, some layered tweed featuring the J.Crew Shift Dress in Multicolored tweed. The tweed in this dress is red, navy, white and gold. When I first tried this dress on, my immediate thought was to wear red shoes with it. I opted for my suede J.Crew Etta heels with a thicker heel and while my first thought was to put a navy blazer on over the dress, I decided on a turtleneck instead. The neckline is a little lower on this dress so again I was trying to figure out how to best wear a necklace and went for a slightly longer one that didn’t sit above the collar line. This dress fits a little more generous in my regular size 12 which is good for those of us with hips but if you have a straighter frame, you might size down a size. I also went back and forth between tights or bare stockings with this but I wasn’t sold on red shoes and dark tights. I’ll probably play around with the red/gold/navy combo for future – I have gold shoes that I think would work with this dress and I might also punch it up with a red cardigan or blazer to pull out the red. Another month gone by! Any favorite outfits from this month? Would love to hear what you think and thanks for visiting!